*Whitney Houston’s daughter Bobbi Kristina will start receiving portions of her $20 million inheritance from her mother and family members of the late singer are worried. Bobbi Kristina will receive 10 percent of her mother’s $20 million estate ($2 million) when she turns 21 on March 4, another 6 percent when she turns 25 and the remainder of Whitney’s estate on her 30th birthday. 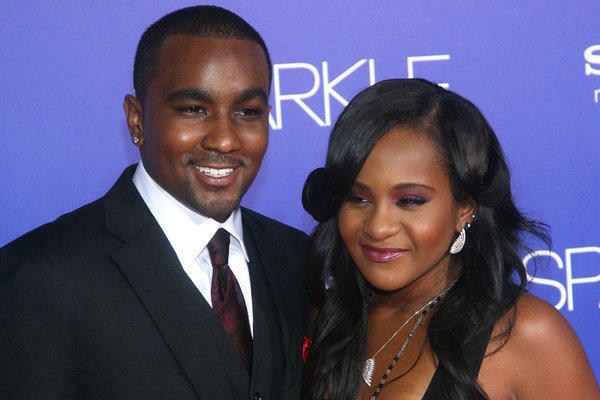 The National Enquirer reports that Whitney’s family are afraid that Bobbi Kristina’s new husband, her “adoptive” brother Nick Gordon, rushed her to jump the broom in order to get a piece of her pending fortune. To make matters worse, sources claim that Bobbi Kris did not have a pre-nup drawn when she married Gordon. Although Whitney took Nick in as a 12-year-old and acted as his guardian, the singer never formally adopted him. As a result, sources believe this is the reason behind the current situation. This girl has been through a lot, I think they need to be a little more supportive before they ruin her and make her have a breakdown like Michael Jackson’s daughter. She’s married, seems happy, just let her be. She could be running around doing a lot worse. Thankfully, “The Queen” Whitney Houston, had the foresight to space out her inheritance in case a situation like this arises. So worse case scenario they’ll get the $2 million blow it and realize they shouldn’t have gotten married, it wouldn’t really be a big deal since she has another $18 million coming. What will be a big deal is if she sees all these family matters coming at her because of this money. It must really be hard to be a young person with money with absolutely no one they can trust. They was so high on something on a video about them getting married and he was driving. he is a snake in she did not want to listen to no one about him. One day he is going to destroy her, leave her in take as much money as he can. Time will tell. He has to much control over her. She is in to much pain to see clear, she needs prayer. A prenup isn’t really necessary. Property (or money) acquired through inheritance does not generally constitute marital property. They may blow some funds together, but if she divorces him, he won’t get anything pre-nup or not. For those in the AA community who have such wealth, this is all too often the problem. None or poor wealth management and inheritance planning. Since Bobbi was underage when her mother died, someone in the family should have intervened as to the distribution of her inheritance and stepped in to be a guardian to set up a trust fund so that any future husband, long-time love, mate or boyfriend would not have the ability to get to the funds. Typical.